''An Alan Smithee Film Burn Hollywood Burn'' is a spectacularly bad film--incompetent, unfunny, ill-conceived, badly executed, lamely written, and acted by people who look trapped in the headlights. The title provides clues to the film's misfortune. It was originally titled ''An Alan Smithee Film.'' Then ''Burn, Hollywood, Burn!'' 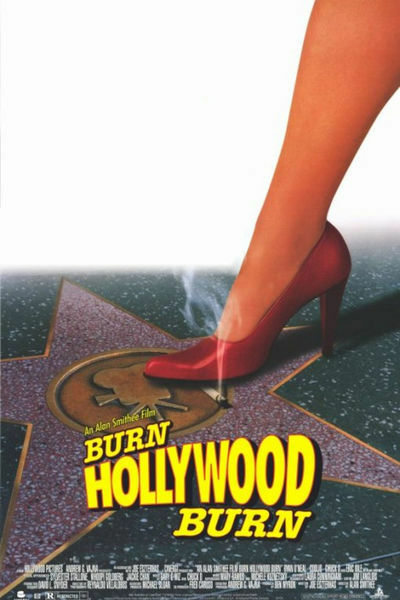 Now its official title is ''An Alan Smithee Film Burn Hollywood Burn''--just like that, with no punctuation. There's a rich irony connected with the title. ''Alan Smithee'' is the pseudonym that a Hollywood studio slaps on a film's credits if the original director insists on having his name removed from the project. The plot of ''AASFBHB'' involves a film so bad that the director wants his name removed, but since his real name is Alan Smithee, what can he do? Ho, ho. Wait, it gets better. The movie was directed by Arthur Hiller, who hated the way the film was edited so much that, yes, he insisted his name be removed from the credits. So now it really is an Alan Smithee Film. That leaves one mystery: Why didn't Joe Eszterhas, the film's writer, take off his name, too? I fear it is because this version of the film does indeed reflect his vision. Eszterhas is sometimes a good writer, but this time he has had a complete lapse of judgment. Even when he kids himself, he's wrong. ''It's completely terrible!'' a character says of the film within the film. ''It's worse than `Showgirls'!'' Of course Eszterhas wrote ''Showgirls,'' which got some bad reviews, but it wasn't completely terrible. I was looking forward to explaining that to him this week, but he canceled his publicity visit to Chicago, reportedly because his voice gave out. Judging by this film, it was the last thing to go. Have you ever been to one of those office parties where the PR department has put together a tribute to a retiring boss? That's how this film plays. It has no proper story line. No dramatic scenes. It's all done in documentary form, with people looking at the camera and relating the history of a doomed movie named ''Trio,'' which cost more than $200 million and stars Sylvester Stallone, Whoopi Goldberg and Jackie Chan, who play themselves as if they are celebrity impersonators. The film stars Eric Idle as Smithee, who eventually burns the print and checks into the Keith Moon Psychiatric Institute in England (ho, ho). Ryan O'Neal plays the film's producer. I love the way he's introduced. We see the back of a guy's head, and hear him saying, ''Anything!'' Then the chair swivels around and he says ''anything!'' again, and we see, gasp!--why, it's Ryan O'Neal! I was reminded of the moment in Mike Todd's ''Around the World in 80 Days'' when the piano player swivels around, and, gasp!, it's--Frank Sinatra! These actors and others recount the history of the doomed film in unconvincing sound bites, which are edited together without wit or rhythm. One is accustomed to seeing bad movies, but not incompetent ones. Sophomores in a film class could make a better film than this. Hell, I have a movie here by Les Brown, a kid who looks about 12 and filmed a thriller in his mother's basement, faking a fight scene by wrestling with a dummy. If I locked you in a room with both movies, you'd end up looking at the kid's. Here's an interesting thing. The film is filled with celebrities playing themselves, and most of them manifestly have no idea who they are. The only celebrity who emerges relatively intact is Harvey Weinstein, head of Miramax Films, who plays a private eye--but never mind the role, just listen to him. He could find success in voice-over work. Now consider Stallone. He reappears in the outtakes over the closing credits. Such cookies are a treat for audiences after the film is over. Here they're as bad as the film, but notice a moment when Stallone thinks he's off camera, and asks someone about a Planet Hollywood shirt. Then he sounds like himself. A second later, playing himself, he sounds all wrong. Jackie Chan copes by acting as if he's in a Jackie Chan movie, but Whoopi Goldberg mangles her scenes in a cigar bar, awkwardly trying to smoke a stogie. It's God's way of paying her back for telling Ted Danson it would be funny to wear blackface at the Friars' Club.